Learn To Play Rock Guitar!, Issue #002 -- Finger Exercises! So here we go. In January, I talked about how using a metronome can really help improve your sense of timing. So how'd you do? Are you getting the hang of playing along with a metronome keeping time for you in the background? After a while, it just becomes second nature and you barely notice it. But you know what? The better you become with your timing, the better you'll be with a real drummer keeping the beat. So that means you're that much closer to playing in a band, if that's your goal (did I say 'that' enough for you?)! Now with your new and/or improved sense of timing, what to practice? Well, if you took my suggestion last month and picked out a song with some sheet music or tabs, you should be progressing along and can probably play that song pretty well at the normal speed. But what if you couldn't find your song in sheet music, or you could find tabs, but didn't really understand how to read them? If you remember from the Getting Started section of the site, I talked a bit about tabs. Ya know, what they are, how to read them and so on. That should get you moving in the right direction, and if not, why don't you ask for some help? I'm here for ya! And don't forget, if you're having trouble learning songs, you can slow them down with Song Surgeon. Slowing them down to a manageable speed can work wonders on your ability to hear all the notes. Just think, if you're interested in some blistering solo, slowing it down so you can learn all the notes. Your friends will be blown away when you rip out the latest Metallica tunes! So why not work on your finger strength and timing by doing some simple scales? You can start very simply with just your first and second finger (index and middle). Set your metronome to 80bpm and place your index finger on the first fret of the sixth string (low E). On the first beat, pick that note. On the second beat, place your middle finger on the second fret, sixth string. Next beat, move your index finger to the A string, first fret and pick that note. Continue with this exercise on each string, changing the note with each beat. Once you've reached the second note on the first string (high e), work your way back down the strings in reverse until you get to the first note on low E.
For the next beat, move your index finger up to the second fret on string 6. 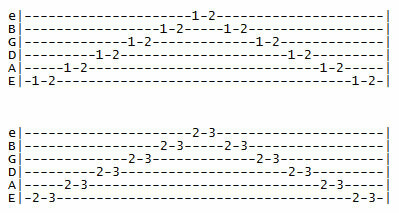 Repeat the exercise on each string, from low E to high e and then back down. Continue like this all the way up the neck and then back down. You're killin' two birds with one stone here - you're practicing your timing, and you're also training your fingers to move across the strings. Your fingers 'memorize' these exercises, which helps you with your speed. This will help you if - or when - you decide lead guitar is what you should be playing. After using your index and middle fingers, you can then do the same exercise with your middle and ring fingers, moving up the strings and fingerboard the same way you did with the first exercise. And when your done with that one, do the same with your ring and pinky fingers - this is where the real workout is. Feel the burn! You might need to practice this twice as much as the first two exercises. We can thank my buddy Adam St. James for these exercise. Adam is an instructor and professional guitarist (and more) from the Chicago area. He's written many books about playing guitar, interviewed and performed with many artists, even run a guitar magazine. But his real passion is playing, and teaching others how to play, guitar. The Mighty Axe! In fact, you can get these lessons and 12 more for free at Adam's website http://www.logicalleadguitar.com. He's offering two free books as a download just for visiting and signing up for his free newsletter. Are you getting the hint here? …FREE…!!! Just wanted to let you know about some new Learn-to-play-rock-guitar.com family members. Just coming onboard are WonderHowTo.com and Audiofanzine. WonderHowTo.com offers tons of instructional videos, including over 1000 guitar related vids. Audiofanzine keeps you up-to-date on all the latest music and gear news, as well as reviews for gear, forums for all you questions and articles to help keep you in-the-know. Just got the latest issue of SweetNotes® from Sweetwater. If you're a fan of vintage Fender guitars and basses, you should check them out over at Sweetwater. They've got the Road Worn series available and in stock. These are cool vintage reissues of the guitars that made Fender famous - the Telecaster, Stratocaster, Precision Bass and Jazz Bass. They all weigh in at about $1000 bucks, so you're looking at investing some cabbage to get these gems. But from what I've read, the investment is worth it. If you are an iTunes subscriber, no doubt you know about the free downloads you can get each week. But did you know that there are guitar lessons you can download? As I was getting my weekly download (I usually grab whatever they've got - hey, if it's free, it's for me! ), I noticed in the Free section a Slide Guitar Techniques lesson on video. So I checked it out. Turns out they've got a complete series you can buy with each season highlighting different decades of rock music. What's nice is you can download the first video from each season for free. It's easy. Just open iTunes, go to TV Shows, Nonfiction, iViDEOSONGS. Click on one of the seasons and the first video is free to download. Get 'em now before they start charging for 'em! That's it for now. Keep practicing, and be sure to check back often for new stuff. I promise to do better with on-time newsletters!